If you are looking for a cleaning cloth that is super soft, gentle and safe for tablet cleaning, -as well as lens and screen cleaning-, Photosilk® is a cloth of choice, as it will deliver the perfect shine and effortlessly remove even the most stubborn of smudges. Photosilk® imprinted with photos of birds are fun, sometimes comical and always useful gifts for birders. "Road Runners are members of the Cuckoo family. They can fly but spend most of their time on the ground, hence their name Road Runner. 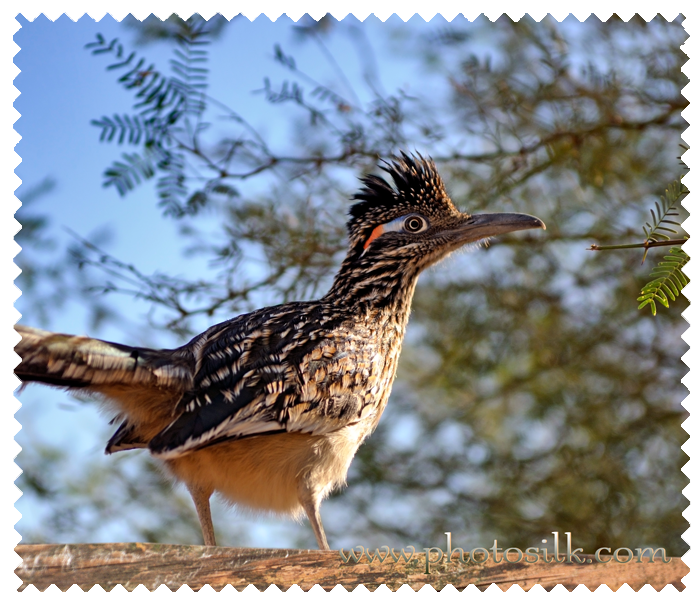 The legendary roadrunner bird is famous for its distinctive appearance, its ability to eat rattlesnakes and its preference for scooting across the American deserts, as popularized in Warner Bros. cartoons. Its lightning fast reflexes, allow the roadrunner to prey upon rattlesnakes. Using its wings like a matador's cape, it snaps up a coiled rattlesnake by the tail, cracks it like a whip and repeatedly slams its head against the ground till dead. They avoid predators such as coyotes in sprints of almost 20 miles per hour, using their long tail as a balancing rudder." For best results, we recommend that you use Photosilks® dry or with a touch of water. Our microfiber will get softer wash after wash and can be used time after time; no chemical solutions are needed, making Photosilk® an environmentally friendly product.